You are a dark elf. You have sworn in blood and sacred shadow to destroy your oppressors, the aelfir, -high elves from the frozen north who have claimed your homeland as their own. Spire is a mile-high metropolis and you hide in its crumbling temples, its lawless undercity, its labyrinthine tunnels, the rotting hole in reality that festers at its centre. Your masters while away their days in opulent cruelty and glittering sunlight far above. Spire is all the world you have ever known, and it must fall. How far are you willing to go for the revolution, and what sacrifices will you make to see the drow in control of spire once more? 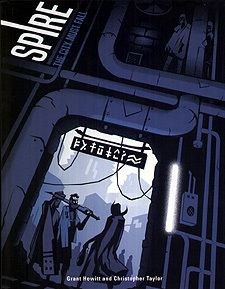 Spire is a fantasy-punk roleplaying game of intrigue, subterfuge and seduction. You and your friends will become a cell of desperate drow freedom fighters and claw back control of the city from your aelfir overlords, no matter what it takes. It uses a simple rules system that helps you to tell stories of brutal rebellion where life is cheap, alliances are temporary, and magic is strange and perilous. This book contains all the rules you need to run games in Spire, along with a detailed breakdown of the districts and factions that make up the city.